Colour, pattern, texture and shine give an outfit depth, making it look more interesting, eye-catching and attractive. If you think your outfit is missing something, troubleshoot by assessing whether it needs the addition of one or more of these elements. By mixing colour, pattern, texture and shine you can create all sorts of looks that keep your style fresh and rut-free. For a maximal and complex vibe, incorporate all four elements. If you’re a simple and minimal dresser, incorporate one or two at a time. By colour I mean non-neutrals, so not black, shades of white and tan, dark blue, grey or dark brown. Sometimes olive is thought of as a neutral too. That said, non-neutrals needn’t be bright. They can be pastel, muddy, jewel-toned, mid-toned, and even very dark like a rich Bordeaux, eggplant or forest green. You can wear neutral clothing and bring the colour through with footwear, accessories, eyewear, make-up and fingernail polish. When your eyes are a very bright blue or green, that also effectively adds colour to your look. Body ink and dying your hair a rainbow colour can also add colour to your style. A pattern is a repeated decorative design. We tend to think of bold, bright patterns, but they can also be subtle. Patterns composed of low-contrast neutral colours and small motifs are the most subtle of all. You can choose to go bold or subtle. You can also mix several patterns in one outfit. At the other extreme there are people who never wear patterns at all. Texture is usually created through the surface interest of fabrics or from the embellishments on clothing, footwear and accessories. Texture creates tactile as well as visual interest, and is particularly popular with those who prefer to sport a neutral style. Your hairstyle can add fab texture to your outfit. On the extreme side, long and wild curly hair that is left down and not tied back adds busloads of texture to an outfit. Long sleek and straight hair adds more subtle texture. Shine is created by incorporating anything that shines in your outfit. You can wear shiny clothing, sport metallic footwear, belts or handbags, or pile on shiny jewellery. Adding shine to your lips is a more subtle approach. You can sport shiny nails, wear gold eyeliner, or simply dazzle people with your shiny smile. I incorporate all four of these elements into my style, and often sport two, three or four of them in one outfit. I’m biggest on colour and shine because it positively effects my mood. I sport brights, pastels and earth tones regularly, and in all wardrobe items. I like blue mascara. I love to wear shiny lipstick, metallic anything, and bright white pearl jewellery. I adore classic patterns and pattern mixing, although most of my wardrobe is solid. I also enjoy incorporating texture like faux fur, pom-poms, suede, patent, velvet, embroidery and tassels. The outfit below incorporates all four elements. Even if this look isn’t for you, it’s fun to admire from afar. How do you incorporate colour, pattern, texture and shine into your style? Hmmmm. I agree, but you don’t have to incorporate all the components in a single outfit or you risk looking desperate for attention. Texture = not too hard this time of year, with fuzzy sweaters and layers. In the summer I find this more challenging, as I am not a linen wearer. I even took Angie’s recommendation and bought pink velvet shoes, which got a lot of compliments when I wore them. Shine = I’ve gone off shiny jewelry in favor of more matte styles recently. Someone please bring back patent leather! It’s been 8 years since I bought my last patent leather handbag with Angie in NYC and I would love another. I wear at least one non-neutral colour as part of every outfit and love jewel tones. Most of my wardrobe is solid, but I often wear patterned items, and I enjoy pattern mixing. My favourite patterns include polkadots, small checks and narrow stripes. I love to wear velvet, velour, suede and faux fur, as well as structured knits (rib knits, cable knits, etc.). I guess braided items also count as textured items? I love my braided (non-neutral!) belts. I like my jewellery to have at least some shine. And I always wear shiny lipstick and (transparent) nail polish. Many of my scarves have a subtle shine. And I love silver shoes, bags and belts. 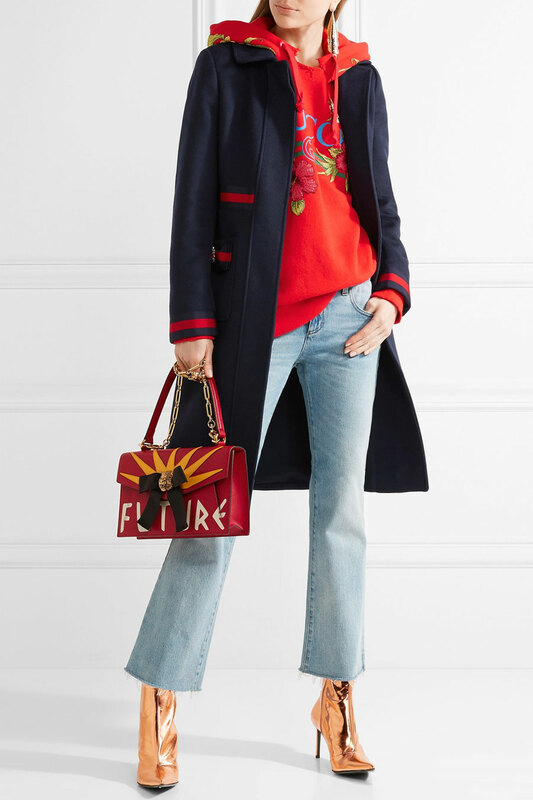 Color, texture, pattern, shine: Michael Kors’ “icing and fluff” as compared with the “meat and potatoes” of basics that let the other elements stand out. I’m not adventuresome with color and only slightly more so with pattern. As a small person with messy curls and color in my face (i.e., I wear lipstick and have green eyes), for me that’s enough already. This is a great reminder, Angie. Thank you. I remember Transcona Shannon (how I miss her!) used to repeat this mantra frequently! I incorporate colour easily. Ditto for shine, although that was not always the case; when I showed up here at YLF I had never thought of it. But once i figured out its value to outfits, my magpie nature soon took care of that! I love classic patterns such as stripes and plaid, with the occasional floral or abstract floral thrown in. I enjoy a subtle pattern mix. The element I’m less good at incorporating is texture. One reason I adore the fringey scarf Ms. Mary sent me is for that fun boost of texture. Knits provide some subtle texture in winter (or can, depending on the type) but I find I don’t vary textures as much as I might like. That’s one reason the mixed media trend was a helpful one to me — it put the mixed textures in one piece and you didn’t have to do it yourself! Thank you for great tips! I want my outfits to look interesting and pleasing to the eye and at the same time to look simple and casual and like I haven’t spent a lot of time planning it. I think finding shapes and colours that suit me along with tips like these are a great way to achive this. Like, wearing a colourful pullover doesn’t look like I’ve spent more time getting ready than wearing a grey one! Today I’m wearing a blush pink pullover in a wool-mohair mix (colour and texture) and black patent leather shoes (texture and shine). Pattern is the one from the four I use the least. Thanks again! I knew well about color and pattern, but those are not always easy to do in a work outfit.One of my (several:-)) great discoveries here at YLF was that texture & shine will also add enough interest to an otherwise neutral outfit when wearing on myself. So, now I love patent for all kinds of accessories (shoes, belts&bags) and find the use of leather in other clothing items than just the obvious moto jackets will still add interest being more torelable for my softer modern classic style. Fur, buckles, pom-poms, edgy lace & daytime sparkle (like the use of a subtle metallic thread in a plain knit for example) are another great way to make my otherwise day to day neutral work outfits bearable for my otherwise more creative style persona. I struggle with adding more than one of these elements at a time to my outfits. My style in general is very basic, centered around black/white/grey. I may add color one day, a pattern another, etc, but when I attempt more than one at a time I never feel like it looks very cohesive. Yet I love these combinations on others. This morning I put on a black and white patterned dress, black blazer, tights, and shoes. I tried to add a colored scarf, but didn’t feel like any that I had added to the outfit. In the end I put on a simple pearl pendant necklace for just the tiniest bit of shine. This is such a great mantra as there are times when I feel an outfit is a bit flat. Having some fab accessories is a great way to add these elements. I have some metallic boots and love to wear them to add interest. Good reminder that we should not exclude our hair and make-up when considering these factors. I feel pretty confident with all of these components and mixing them together in an outfit. I found your comments about hair very interesting. Mine- long, naturally curly- certainly adds texture, and I like to balance its exuberance with my clothing choices. I generally incorporate one color with neutrals in my outfits, and have recently added a belt and shoes to my red capsule. I absolutely love texture- interesting weaves in jackets and skirts, detailing on shoes. As I think about it, my pieces with texture are some of my workhorses and favorites. Pattern sometimes comes into play, but rarely, and often just in a scarf. I hadn’t thought much about shine until joining YLF. Other than small amounts of jewelry, that’s by far the least represented in my outfits. This is a great reminder. Lately I have been feeling like my outfits are boring. I think I need to see if I am missing these. Probably the easiest element for me to add is texture. I love lace and velvet. And I use prints, especially in scarves. Shine is one that I could add though and I think it would be fun. Great reminder indeed. And I respectfully disagree with Sterling ; I’d wear the outfit above (maybe with different metallic boots though) in a heartbeat, and I don’t think it would be because I was desperate for attention. Sometimes the visual and psychological appeal of the CPTS mix can be so positive to the wearer. How can you not want to embrace it? I am probably less likely to add pattern – not because I don’t like the look of it; I simply have little-to-none in my wardrobe. This is perfect; just a few hours ago I posted that I sometimes feel an outfit is lacking, but don’t know what to do about it. Terrific analysis of adding interest to outfits in subtle ways. My Bordeaux and pewter handbags add color and shine, respectively, and I always reach for them when wearing my navy and black dresses. I also love adding pearls, cubic zirconia-and-rhodium baubles, and silver sculptural jewelry for shine. At the office, I’m often sporting a black patent belt and black patent shoes – especially in the winter, when I’m wearing one of my two long-sleeved black dresses with black tights. Now I understand why I instinctively added those elements of shine (plus I almost always add pearls to those outfits) to add some depth and interest. Love how your analysis articulates principles that we may have unconsciously grasped. Texture is one of the reasons I love autumn/winter dressing. Nubby knits and tweedy jackets will always sing to me, but it’s also easy to add texture with tights or even footwear. I have laceup Frye boots that add fun texture in an easy and low key way, and the elbow patches on one of my jackets adds texture too. Color is also represented in my closet as deep jewel tones. I’m wearing a heavenly deep jade cashmere turtleneck as we speak. Shine is less represented although I enjoy wearing yellow gold, mostly in non-matte finishes. Pattern is the toughest one for me. I like the occasional hectic pattern, and graphic patterns are a love, but pattern mixing is still something I’m working on! Oh, and patent leather. LOVE. This is a great post and very useful to make the outfits interesting and fun to wear. I wore something that fits this post but it is too late to link. Sterling, or you’re simply a maximal dresser. There are many on our forum who I doubt are “desperate for attention”. They prefer outfits with more going on. It’s a style, their sartorial preference, and one that makes them feel fab, IYKWIM. Laura, I see patent coming back in footwear. Lets hope it trends soon. And 8 years, already! Happy Days. Much love to you, my friend. The Cat, high five. You like classic patterns too. YES, braiding is textural. Nice addition. April, my sweet tooth prefers icing to meat and potatoes, so I’m consistent! I love your curls and gorgeous glass green eyes. Suz, Queen Radiant Health shines from the inside out. Sigrid, Alecia, Kathie, Penny and Lyn67, there you go. You’ve figured it out your way – good job. tansstaafi, sounds like you are a very neutral dresser. That can work well. Bijou, metallics are an easy and fun way to add shine. High five. Robin F, I love lace with you, and printed scarves are effective. Lisa p, I nodded along with your comment. I also love pattern and pattern mixing – but don’t have lots of patterned clothes. fashiontern, YAY. Glad this was helpful. Beth, a pattern-free style is fab. Follow your feelings. And ask Tango for his advice. Joyce, it’s never to late to link to a post. Great reminder. Thinking about what I typically do, it’s texture and shine. Texture I’m always drawn to, and shine I use in more subtle ways, usually with shiny lipstick or nail polish, and patent leather accessories. This season I’ve been able to add several patent leather items, including two pairs of shoes, and one purse. Pattern I’m typically not drawn to, but I’ll certainly look to add some pops of color to my outfits this winter. Though come to think about it, my shiny bits are usually quite colorful. Interesting. Color is definitely the most reliable way to express or change my mood. Texture, especially in cold weather, adds a lot, too. But pattern, unless it’s the most subtle geometric like a tiny bird’s eye check, foulard, or shirting stripe, is almost always just wrong on me. Shine is even trickier: patent leathers, bright metallics and shiny satin do something terrible next to my skin, I don’t know why. I’m much happier with a hint of sparkle–a sprinkling of sequins or some vintage crystal jewelry feel like a party to me–or even better, some quiet opalescence. As always a very interesting post.Good to be reminded that outfitting has many dimensions other than shape and colour.I think texture and shine are particularly important if you are going to wear one colour from head to toe.For example a black outfit always looks more interesting if some of the elements are textured or shiny.I tend towards minimalism but as I have got older I can feel myself adding more pattern ,texture and shine to outfits.Maybe it’s a confidence thing or maybe I m hoping to distract from my aging face!whatever,I think it makes a look more interesting. Yes, yes, yes, and yes. And often all at once. Good reminder. I think I often incorporate two of these elements but and a third or fourth could really amp up the interesting in a basic outfit. Thanks for another informative post – a great jumping off point for an end of year analysis of the contents of my closet and drawers. Thank you for this timely reminder of the ways to “fix” an outfit. This explains why fall/winter outfits are easier and more fun and hot weather dressing more difficult. Today I’m wearing a wine and lilac plaid flannel shirt over a lilac light wool sweater (color and pattern), jeans with moto knee panels (texture), my trusty black bootlets with studded toe caps (texture and shine). Jewelry and hair sparkles go without saying. Purple puffer (color and texture). I’ve got it all covered. Angie, never too late to link to a post? How can I connect this one to mine earlier today? I kinda have the same look on today, only metallic silver booties. It feels fun. Same question as Fashiontern, how do I add the link to my existing post? I incorporate pattern, color and shine fairly easily. It’s texture that my outfits are usually lacking. This is something I need to remember when an outfit is feeling boring – maybe some texture would add the oomph that’s missing. Since I restrict my color palette and don’t wear many patterns, I rely heavily on texture to pull outfits together. I think I’d have a harder time wearing all black if I didn’t wear denim most days. The rough texture and slightly variegated color / fading add depth. I’ve been drawn to shiny things recently, like a crow. Last week I wore a black metallic linen top. I usually have trouble layering it, but I realized it was perfect under a wool/cotton boyfriend cardigan. The dull texture of the sweater toned down the shine of the top for daily wear. Now I want a tee or tank with a similar metallic effect. Interesting! Today I don’t have on pattern. Or so I thought. . . I’m wearing solid colors, but my belt has a pattern to it, made up of small leather circles that create perforations, and studs of different metals. Good article. An outfit without at least one of these elements can be very boring and look unfinished. I love neutrals, but they do need help to look their best. Color adds the element of interest. As does the right jewelery. So are so right on!!! I learned this from Stacy and Clinton on What Not to Wear! I treat it almost like an incantation when I’m in a style rut! Angie, I forgot to thank you for this article and also for a similar older one, which I recently referred to when someone in this forum asked for ways to make an outfit more interesting. I found your old article so inspirational that I got it printed out and keep it in a file together with some other useful style tips. (I just love to read articles on paper sometimes.) Now, I will get this new article printed out too! What I appreciate in particular is that you took the time to explain how you yourself incorporate these four elements in your style. I’m such a texture person. Leather, chunky knits (like the crocheted beanie I’m wearing today), velvet, studs… I especially enjoy black things with pleasing textures and enjoy playing with layering them. I’m also big on patterns, and enjoy bold and subtle ones. The first thing I own that comes to mind reading this is my shiny, black, snakeskin patterned jacket. It hits three out of four of these and looks absolutely stunning over more black because it reflects so much light. I enjoy color, but I prefer to wear more neutrals. Great to hear how you're on the ball with colour, pattern, texture and shine, ladies. The Cat, you are gracious, and it does not go unnoticed. Thank you for enriching this community. Firecracker, patterns can be very subtle – like a false plain. Cardiff Girl, I couldn't agree more about wearing black from head to toe. Joyce & fashiontern, I misunderstood. You can't re-link to a blog post after you've started the thread on the forum already. Joy, hot weather dressing can be all about colour and shine – and look sensational. Kaelyn, we need to see that jacket. What a good way to evaluate outfits. I used to always want a bit of shine, a bit of glam. I’m more subdued about that now, more into pattern and texture. Yes, CPTS! Great as a short hand assessment as to how an outfit is playing. I use all of them, to varying degrees. Pattern is tricky as I miss it in my wardrobe, yet struggle to pull the trigger on adding it. I tend to do so with enduring scarves or fast fashion blouses that don’t always stick around for many seasons. Texture for me is often footwear, bags and outerwear, with some knitwear; shine is jewelry, as well as metallic and patent footwear. I also love matte metallics, my almost shine. Valuable YLF lesson here; thanks, Angie. Ha, Angie–I’ll see if I can get a good picture of the jacket tomorrow when I have decent lighting. I don’t think I have any pictures of me in it. One of my goals for next year is MORE PHOTOS. Each component adds something on its own. The more incorporated into an outfit the better. What a great post. I have spent this past year not buying clothes. Everything new has come hot off my sewing machine, and I have been incorporating more color with the new things I’ve made. I have been using accessories (jewelry, scarves, shoes) to add texture and shine to liven up my existing wardrobe, and to keep me from getting bored. I realized reading this that the one element that gives me pause is shine. I wear colors, love textures and patterns, but will often reject something because it is shiny. I wonder if years of a shiny face (thankfully greatly reduced with age) has anything to do with it! My summer wardrobe has color but I need to be more conscious of adding shine. I enjoy color and pattern already, but generally shy away from shine and haven’t paid much attention to texture. I’m interested in adding a little shine to my outfits. I’ve added very shiny gold flats to my wardrobe. Great post! Regarding these four variables, I pretty much follow a rule of “at least one, no more than two”. For special occasions I might do three. Four is just not my style and is likely to create a strange first impression…the person staring at my outfit and trying to make sense of it instead of listening to what I have to say. But I say it depends on your environment and the people you’re with. When I see a random person walk down the street in a crazy cool outfit, it puts a smile on my face. Like the young man with Treacher Collins syndrome who once said, all dressed in punk: people are going to stare at me anyway, so I might as well give them something fun to stare at! I love them all. Probably the one I use the least is colour because I love neutrals and feel more comfortable with mixing them. But I do wear jewel colours in the warmer months and autumnal colours in the cooler months. Shine and pattern are my favourite elements in summer. Texture can be a challenge in the heat. But it’s a great addition in the cooler months. Very helpful information. I tend to wear neutrals and occasionally add some colour. Angie taught me that hair and your colouring were part of the outfit. I have built-in colour and texture to my outfits. I do like texture in my outfits and tend to wear leather, faux leather, suede and wool. When I wear patterns it is usually on a scarf. Lol I never thought about my hair adding texture before, but Angie’s whole paragraph about wild, curly long hair sounds like it was written about me haha! I think that’s why I generally go for slimmer tops & longer cardigans (nothing too bulky on the upper body). I’m a curvy pear shape with fat shoulders though, so I’m worried what’s going to happen when I get my hair cut short (thinking of doing a short pixie). Oh well, no way to quell the nerves until going on a shopping trip after I get it cut, lol! This is an amazing post and such an excellent reminder. I think that I always have at least three of the four in the outfit, which happens much easier in the winter with all the layers and textures. For example, my watch is mixed metal and my favorite bag is silver, so there is always some (subtle) shine. I have really gotten into mixing a couple pf small patterns/false plains in the same color scheme lately as well. Even if my outfit is mostly neutral, I typically add a colorful scarf or hat in the winter. Digitized Embroidery pattern can also give a stunning look to jackets, pants, t-shirts. Mostly on every Jeans pants have a embroidery pattern drawn on it.